Come and join sound designer Gareth Fry as he takes us on a backstage tour of the critically acclaimed hit of the 2015 Edinburgh Festival "The Encounter". The day will begin with a wander around the set and a demo of the sound system, giving us an insight into how a show like this is created. You can then choose to watch the matinee performance, if you haven't managed to see the show yet, and quiz Gareth during the Q&A afterwards. 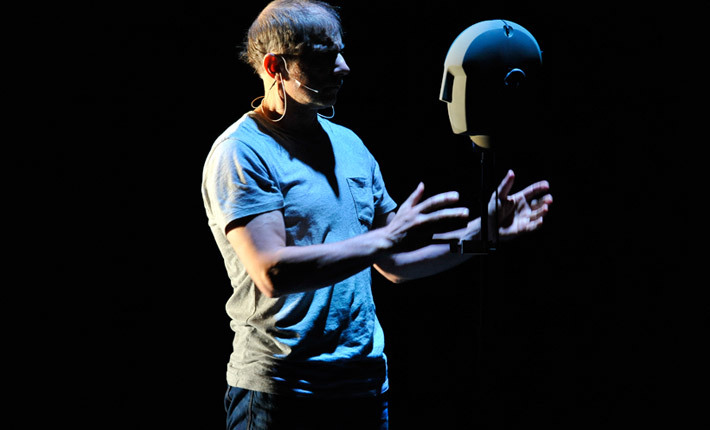 The Encounter is a one-man show with a binaural head on stage, two sound operators and 550 pairs of wired Sennheiser headphones! 5 places are available for the tour only, and 20 are avaiable for the tour, a ticket to the 3pm matinee performance that day and the Q&A afterwards. The tickets for the show are available at the discounted price of £33.50. This event is exclusive to ASD members, and is eligible for the travel assistance scheme. If you're not an ASD member yet, here are some good reasons to join.